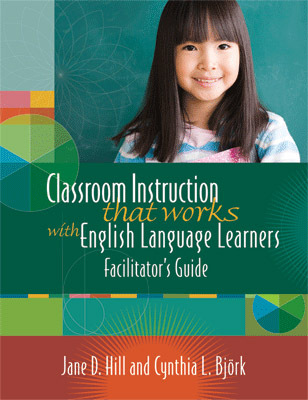 Each participant in your workshop will need a copy of the Classroom Instruction That Works with English Language Learners Participant's Workbook to gain expertise in strategies that are effective with ELL students, including cues and questions, setting objectives, providing feedback, nonlinguistic representations, summarizing, and many more. For more information about scheduling workshops, conference sessions, and consulting services, contact ASCD at ossd@ascd.org. For more information on related resources: send e-mail to member@ascd.org; call 1-800-933-2723 or 703-578-9600, press 2; send a fax to 703-575-5400; or write to Information Services, ASCD, 1703 N. Beauregard St., Alexandria, VA 22311-1714 USA.